Do you want to reload or recharge for your Mobitel Dialog Airtel or Etisalat connections easily? 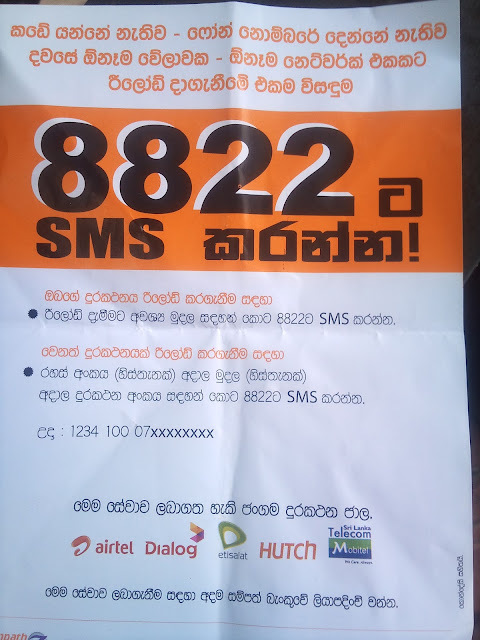 I think Sampath Z Reload method is best solution from Sampath Bank,can reload your mobile phone in few seconds anywhere at any time of the day via SMS.Sampath Z Reload method available for all Airtel, Dialog, Etisalat, Hutch and Mobitel users in Sri Lanka. This service is specially provided to all Sampath Bank account holders and should want to visit your nearest Sampath Bank branch to register your account with your mobile phone number.After the registering type the amount of the reload and SMS to 8822.If you are not a Sampath Bank account holder should want to open a new Sampath Bank account. What's the meaning of password before enter the amount..? Is it a e banking logging password...? I want to know what is that..? You should want to visit your nearest Sampath Bank branch to register your account with your mobile phone. thanks for your visit.